By now you will have guessed that the Samurai Pizza Cats is the name of a cartoon show in anime style. 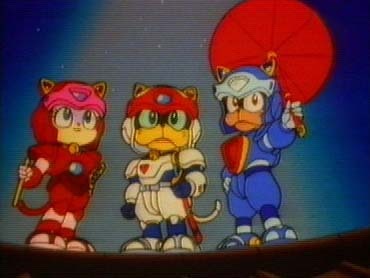 The show is named after the heroes of the show, three cats in a modern day samurai outfit. The name of the show, and even the opening theme indicates that the show is a parody on the Teenage Mutant Ninja Turtles ("We've got more fur than any Turtle ever had!"). Interesting detail: the Japanese version is called Kyatto Ninden Teyande which translates to Ninja Legend Cats Japanese titles rule, don't they? The setting is a Japanese looking village named `Little Tokyo' where the Pizza Cats run a pizza fastfood business. Little Tokyo is populated by all kinds of animals. The official governor of the town is the Emperor, but since he has gone bananas a council takes care of the well-being of the village. One of the members of this council is called Seymour "Big" Cheese, who secretly wishes to take over control of the village. The pizza take away restaurant is merely a cover for their true job... Whenever evil is afoot, the Pizza Cats are launched towards the danger from the gun-lookalike clock tower that emerges from the top of their restaurant. The Pizza Cats have three costumes. They have their day job forms, which all have skirts of some kind with the restaurant logo on the front. The second form are their regular fighting uniforms, and the third are their extra spicy fighting uniforms. The weapons of the B-team can be combined to form super weapons: Bat Cat's helo-pack and Meowzma's power pack combine to form a weapon, fired by Bat Cat. As well, General Catton's cannons and Spritz's water pack combine with Spritz firing the weapon. All four weapons are able to combine into a super mega weapon that fires an energy blast almost equal to that of the Magical Ginzu sword. Luckily the scriptwriters have put evil in every episode, or else the Pizza Cats would be out of a job. Evil usually takes the form of a gigantic monster-like robot, used by the Big Cheese who has set his mind on controlling some aspect of Little Tokyo.